The recipe for the success of the Tubbercurry St Patrick’s Day 10k over the past 45 years is based on tradition. Participants receive a genuine céad míle fáilte at Tom and Annie Killoran’s Teeling St event headquarters. 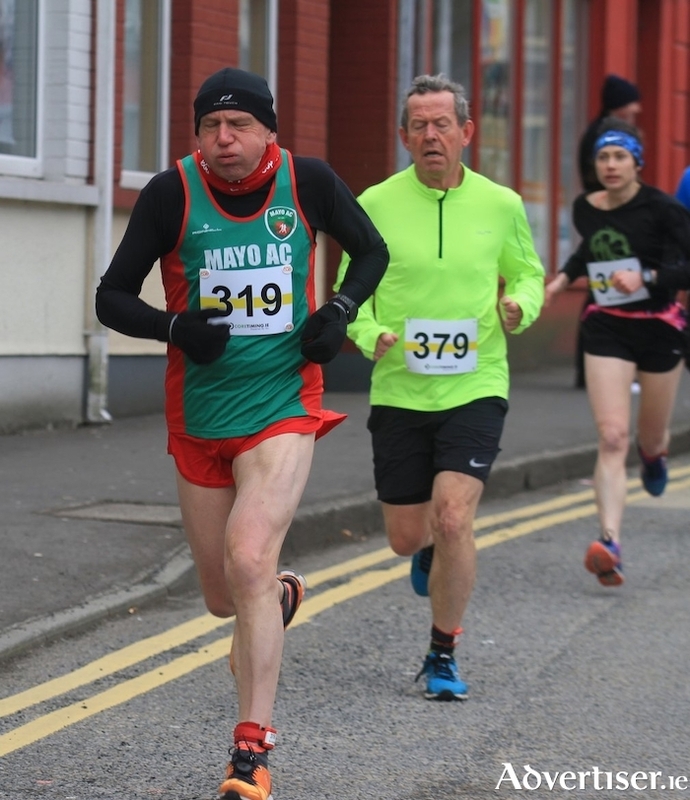 These days days the race is excellently hosted by local club South Sligo AC. Over 100 volunteers led by Gerry Lee ensured the 450 runners in the two races on St Patrick’s Day were well looked after on and off the course. Numbers have been increasing in recent years with the aid of South Sligo AC’s successful 5k programme. Conditions were tough on the one lap course with a chilly head wind until after the 7k mark where the field turned for home and the classic finish at the Square. There was an excellent turnout of club runners with seventeen ACs represented on the startline for the 10k. Teresa Doherty (Finn Valley ) was the impressive winner of the women’s race in a fast 35:49. Sara Doohan ran strongly for second 38:24, ahead of Heather Foley 38:43. John Byrne has had many podium finishes in this race over the past 20 years. It’s testament to his consistent form that he won this race twelve years ago in 2006 in 33:05, This year he was just a minute outside that time and a brilliant fourth overall, and Mayo AC's first finisher in 34:11. Although finding himself a bit isolated at times he stuck in with familiar tenacity and won the M40 category. David Dinsmore was running Tubbercurry for the first time and came home first M60 in a hard earned 43:45.